Rising on the eastern slopes of the Cascade Mountains south of La Pine, the Deschutes River flows northward through Bend. It is dammed just below its confluence with the Metolius River, forming Lake Billy Chinook. Continuing northward, it flows through Maupin and eventually reaches the Columbia River east of The Dalles. The Lewis & Clark Expedition camped near the mouth of the Deschutes River during their return trip upriver on April 21, 1806. 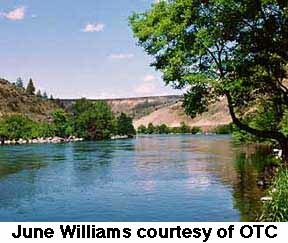 The Deschutes is a popular whitewater rafting river, with many Class III rapids. The river is perfect for families and first-time rafters.